I saw a tutorial over on the Fiskars blog to make a plant decoration, which got me thinking. 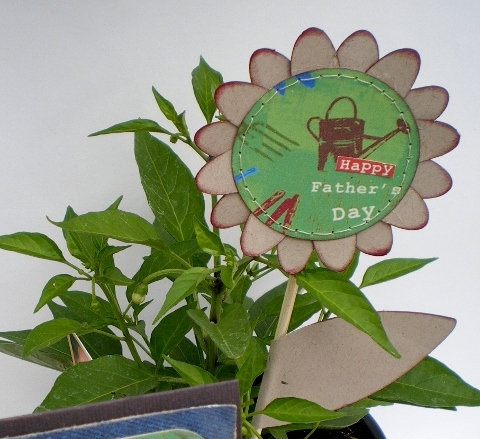 Why not make a plant gift tag for Father's Day. I've cut out the flower and leaf shapes using a Fiskars template and stuck the assembled flower on to a wooden kebab stick. I'm going to write my greeting on the leaf. Looks good in the Chilli Pepper plant don't you think? And here's the matching card. I'm entering them for the Boy, Oh Boy, Oh Boy challenge over at Cupcake Craft Challenges. Glad all the manly 'Dad' stuff is done, I can get back to making pretty cards again. 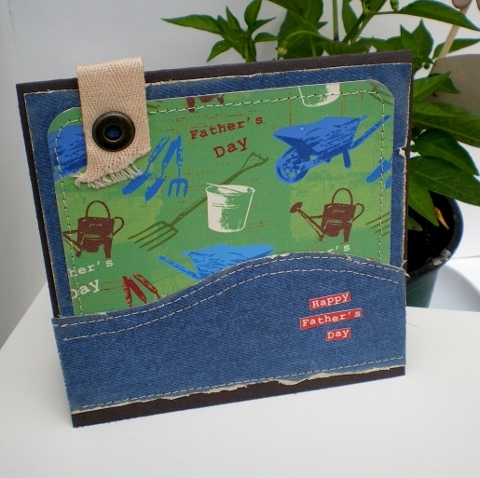 great project and card - perfect for any Dad! What a great idea Vicky - they're both fab! What a great project Vicky and fab idea for a father's day gift! Love it! Both of these are fabulous and I'm sure any Dad would be over the moon to receive them!! Lovely ideas, Vicky!